GoodReads Summary: Join Duck, Hippo, and their friends as they uncover their secret valentines! It’s Valentine’s Day, and something curious is going on. As the birds tweet their love songs, Hippo and his friends Elephant, Pig, and Turtle each receive mysterious, unsigned Valentine’s Day cards. Hippo wonders if his is from Duck; Elephant and Turtle think theirs are from Pig; and Pig dreams that hers is from Turtle. The cards tell the friends to come to the park at four o’clock to meet their valentines—so they’ll find out soon enough! As the clock ticks away, the friends wonder—and dream—about their valentines and make special preparations. But when they arrive…SURPRISE! This Valentine’s Day might not go exactly the way they expected, but one thing is certain: being friends with Duck and Hippo is always a special treat! Ricki’s Review: Valentine’s Day is coming up, and this book will surely drum up the excitement! I brought this book out during my night-time reading session with my kids, and my 5-year-old shrieked, “More Duck and Hippo! Yay!” Duck and Hippo are a beloved duo that are on their way to becoming a classic pair like Frog and Toad. Kids in the current generation recognize them and love them. Adults are starting to recognize them, too! I am just waiting for more Duck and Hippo stuffed animals to appear in stores! One thing I loved about this book is that it focused on friendship. Each of the animals is particularly excited about which friend sent the valentine. There is so much joy as they guess who the secret valentine might be and head toward the park. Readers who are experienced with the Duck and Hippo series can make great predictions while reading the book. Others will just be excited as they turn the pages! This would make a great read-aloud for classrooms on Valentine’s Day because the focus isn’t on commercial items but friendship and neighborly love. Kellee’s Review: In this fourth installment of the Duck and Hippo series, the author continues to teach important lessons to the readers that they may not have thought about. Too often Valentine’s Day is focused on the commercial: How many cards did you get? Did s/he get you a gift? etc. etc. But really, the point of the holiday is to spend time with those you love. And like other stories with unexpected friendship, Duck and Hippo show that opposites attract and first impressions aren’t always correct. In addition to the story, the illustrations add a whole other layer to the story by taking the shared emotions that were written and showing them. Together, the story and the illustrations tell a story that kids will easily connect to and love. Teachers’ Tools for Navigation: Valentine’s Day is often a day of parties in elementary schools. To move away from the commercial focus of the holiday, teachers might use this book to foster a secret valentine’s day party. This would be great fun! Discussion Questions: Who did you predict the secret valentine would be? ; What do each of the animals think? ; What were their reactions when they arrived at the park? ; Is there someone in your life who might enjoy a secret valentine? 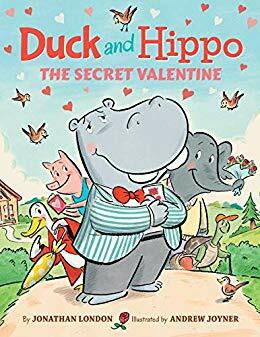 The fourth book in the Duck and Hippo series is a sweet way to celebrate Valentine’s Day! Check out the trailer! Two Lions is offering a copy of Duck and Hippo to one lucky winner (U.S. addresses). I love the message behind this book, that we shouldn’t focus on the “stuff” but on quality time with friends. I’m excited to read this and share it. “After reading this review, what are you most excited about?” Fun illustrations, likable characters, and Valentine’s Day!